Let’s put aside the fantastic plot of finding a room full of an infinite supply of ‘Voyager’ probes and the rockets to launch them, and simply enjoy the game. 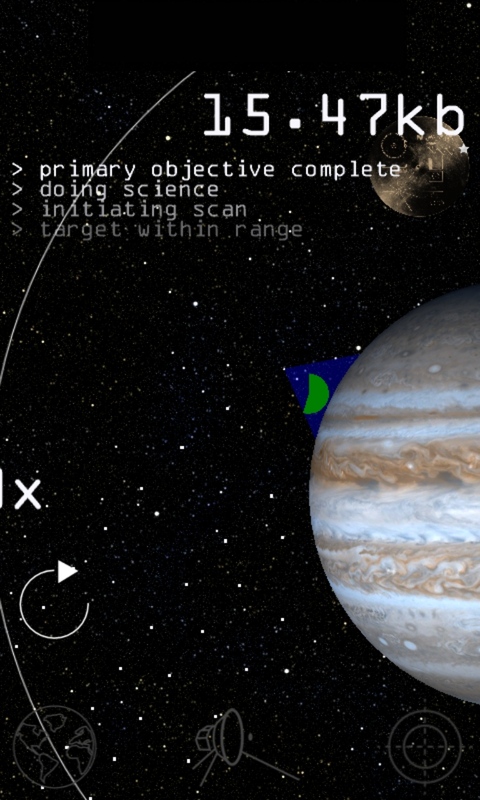 Your goal is very altruistic, to gather as much information as possible as your Voyager spacecraft flies past the various planets of the solar system. You set the departure angle from Earth, you set the level of thrust, and celestial mechanics will take care of the rest. Much like throwing an Angry Bird from the catapult, you set the angle and initial thrust with a slide of your finger. Starting from the centre of the Earth, pull away from the core for the thrust, and then rotate your finger around for the angle. You have a digital readout of these two values, and you should do your best to remember it, because if you want to launch a second mission on a slightly different path, you'll want to use these first values as a baseline to tweak. Each mission to a celestial body can be regarded as the level of a puzzle game, and they all have the same basic function. 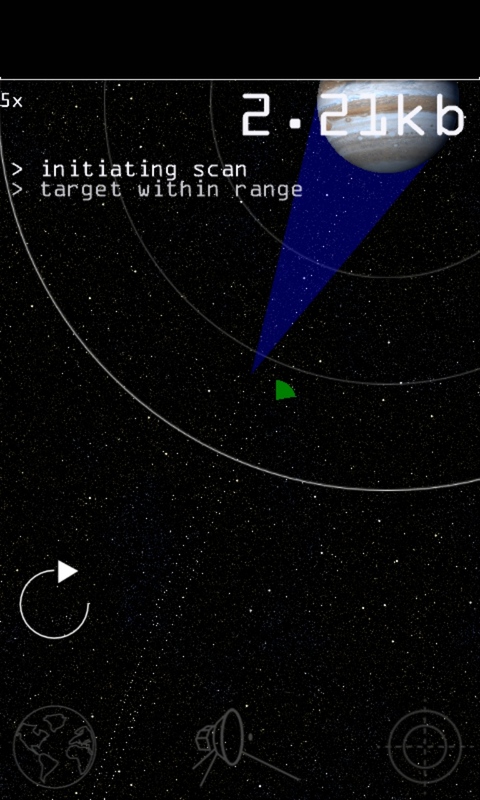 As you come close to the target, the Voyager probe will start to gather data. There is a multiplier on this information depending on how close you can get to the planet's surface... but whatever you do you mustn't crash into the planet's surface. If you do, then any information gathered will be lost, and you'll need to launch another probe to try again. Which is why an infinite number of probes in that room is rather useful. Along the way, and in a little bit of a nod towards the arcade player, there are stars to collect. These might be an indication of a potential route to fly along, but they don't always match up with the best route. Interestingly, you can collect the stars on one flight, and focus on gathering information on a later flight. The key to gathering information is to fly as close as possible to the planet, and as slow as possible. These close approaches and slow speeds result in the Voyager craft's course bending. You'll have seen this in animations of space travel, but now is your chance to play around with it. The early levels (sorry, missions) see you visit single bodies, such as the Moon and Mars, both of which are relatively close, so you can be rather coarse in your choice of orbit and still succeed. 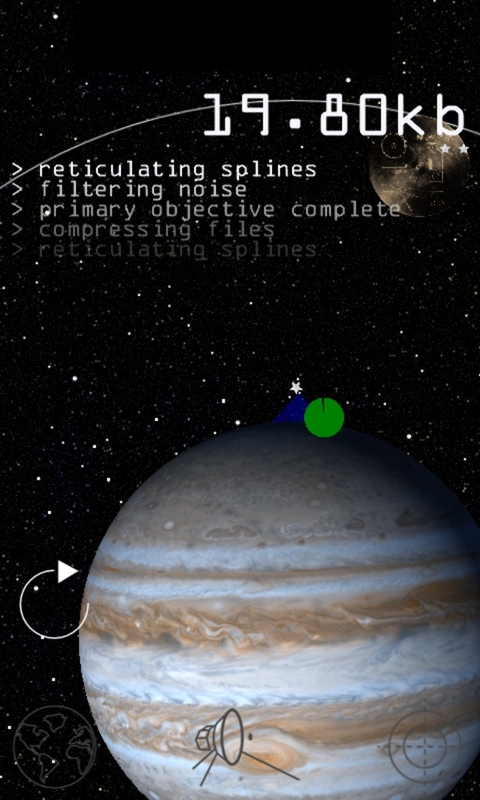 But as you progress into the game, you'll be asked to be more accurate in your orbits to get closer and slower to the planets. 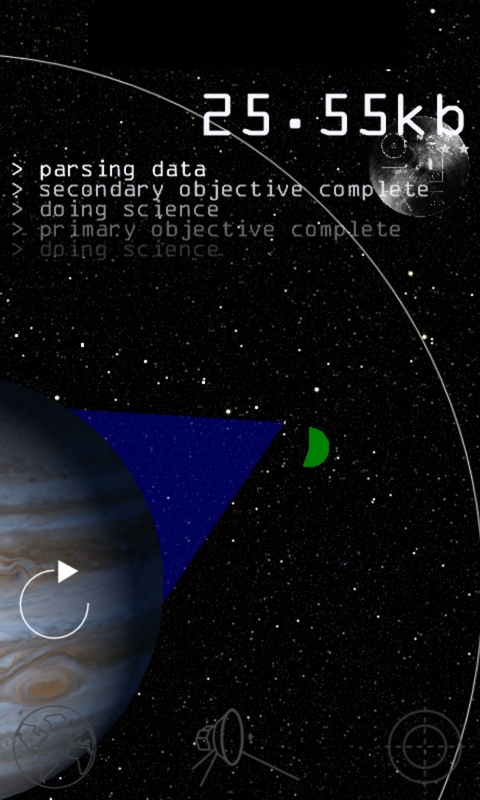 Progress even further and you'll be into the world of celestial snooker and have to aim just to the side of one planet to curve your orbit towards the target in the distance and be accurate in that post-encounter slingshot so you can just skim past the distant target. It's unlikely you'll pick the right course first time around the planet in these later levels, so to help you, the track of the previous orbital paths remains on the screen so you can see your mistakes and plan your next flight accordingly. And of course space is big ["Really big...", see HHGTTG quote here - Ed], and while you don't have to wait years for the Voyager to make the flight, you do spend a lot of time watching the tracks of the orbit as you inch to the fringes of the solar system. Voyager is an incredibly cerebral game. 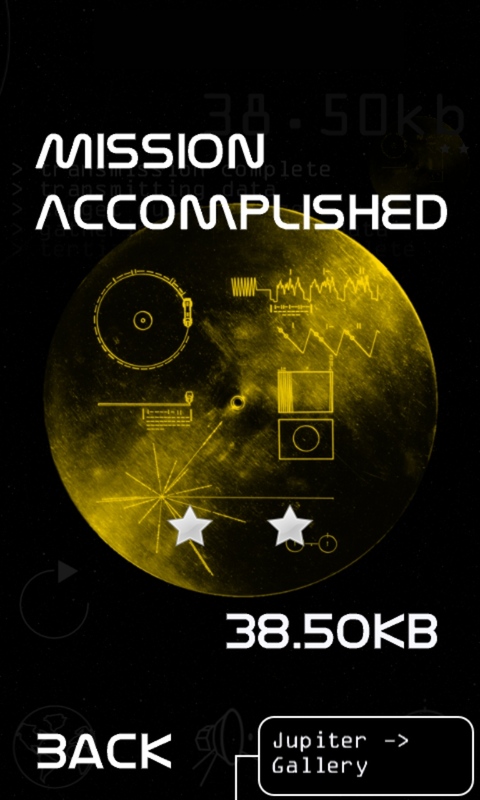 While one flight might take a minute or so, you'll need to make multiple probes to get the trajectory just right, so be prepared to settle in for a good thirty minutes or so to crack the later levels. I have to say that the finger slide method of control is a bit of a let down. A lot of games come down to a few tenths of a degree and it's very much a fiddle to get this just right with your finger and release the touch on the screen without disturbing it. 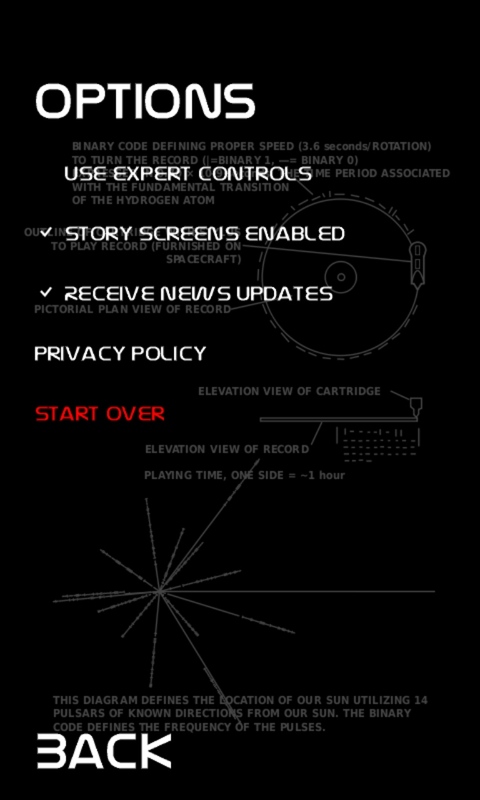 Some sliders, or a way to manually enter the launch data would reduce some unnecessary frustration to a game that is about precision and patience. There is a game in here, but it's not one of the instant reward cycle. There's no 'win' every thirty seconds, there's no freemium 'targeting aid' as an in-app purchase, and there's certainly little help offered in navigating the gaps in the asteroid belt. It feels very much like a game you would have seen on the technically focused home computers of the eighties - computers like the BBC Model B your school may have purchased. That's perfect for me, it feels like a throwback to some of my earliest experiences. What the modern-day young gamer will make of this I'm not sure, but I would urge them to try it so they can be reminded what hard work games can be, and how rewarding it can feel when you finally crack the Jupiter - Saturn - Uranus - Neptune grand tour of our Solar System.